It's almost Princess Aurora's sixteenth birthday, and she's about to throw a birthday party of a lifetime. Come behind the scenes of her exclusive photo shoot to commemorate the occasion. And you're invited to the party as well – The Sleeping Beauty runs FEB 13-24. 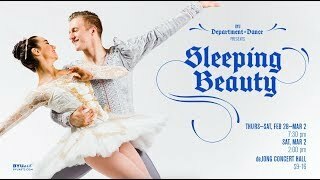 Tickets at nycballet.com/sleepingbeautynnDirector nSean Suozzi nnDirector of Photography nZach Stoltzfus nnEditornNick Paley nnNew York City Ballet CastnPrincess Aurora --- Lauren LovettenCarabosse --- Maria KowroskinCatalabutte --- Aarón SanznThe Lackey --- Ghaleb KayalinThe King --- Ask la CournThe Queen ---Meaghan Dutton O’HaranLilac Fairy ---Teresa ReichlennFairies --- Alston Macgill, Mimi Staker, Claire Von EncknFairy Attendants --- India Bradley, Sasonah HuttenbachnGuards – Davide Riccardo, Gilbert Bolden IIInnActorsnPhotographer --- Erik Tanner nDirector --- Lena Friedrich nSound Recordist --- Annie Battles nAssistant Camera --- CJ Ferroni nDirector of Photography --- Derrick Belcham nStylist --- Brooke Bennett nStylist Assistant ---- Jessa-Raye CourtnAssistant Director --- Isaac Aden nProduction Assistant --- Forest Jade, Caitlin Ramos nn1st Assistant Director nRamiro A.
Quintero nn2nd Assistant Director nJoy L.
Grant nnSound Recordist nBrian Flood nnAdditional Cinematography nDerrick Belcham nn1st Assistant Camera nJesse Sanchez-Strauss nn2nd Assistant Camera nJulia Crytser nnGaffer nCory Beisser nnKey Grip nMark Solomon nnBest Boy Electric nBrandon Woodruff nChelsea Soby nnBest Boy Grip nKaity Barnes nGarrett DoermannnnProduction Designer nEugene Choi nnArt Production Assistant nCourtney Abbott nnKey Production Assistant nMaximiliano Lovera nnProduction AssistantnForest Jade nIdris Kennedy nCaitlin Ramos nnHair nSuzy AlvareznnMake-up Artist nKarla Elie nJessica M.
Pichardo nDelina MedhinnnNail Artist nThe Editorial Nail, Gracie J.
nnCostumes bynPatricia Zipprodt; executed by Barbara Matera, Ltd.n nNYCB WardrobenNorma AttridenJohn RadwicknMarlene OlsonnBakr LusasetnJay Sangstern nCrew StylistnBrooke Bennettn nCrew Stylist AssistantnJessa-Raye Court nnColorist nSam Daley nnSound Design & Mix nBrian Flood nnMusic nThe Sleeping Beauty (Op. 66, 1888-1890) nBy Peter Ilyitch Tschaikovsky nPerformed by the New York City Ballet Orchestra nnProduced by New York City Ballet nRebekka B.